Rachael arrived for her appointment and as usual she will often give me the colour scheme she was after. Today she told me that she wanted red nails but as I was preparing them for acrylics she started talking about loving her friend's nails that I did a few weeks ago which were Shellac Azure Wish with silver. Somewhere along the line I showed her a swatch of a blue glitter and she had made up her mind. 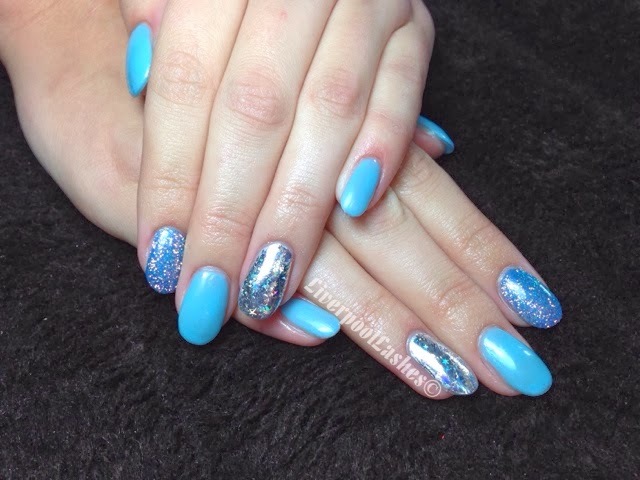 She decided on Shellac Azure Wish on every other finger, Silver Chrome on her ring finger with Silver Starburst foil and her index finger is Shellac Water Park with White AB glitter on top. I have to admit that this is probably one of my favourite sets of nails that I have created recently, the glitter blows my mind it's that beautiful!